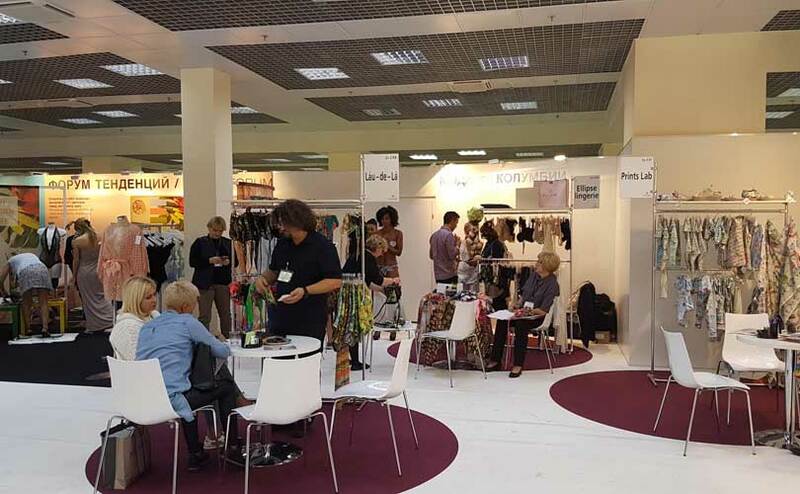 Adventures of Colombians in Russia - Wholesale holding "Northern Venice"
The latest Mode Lingerie and Swim Moscow/CPM trade show has seen for the first time the introduction of the brands from Colombia: Ellipse, Prints Lab and Laudela. These brands have just appeared on the Russian market, but are planning the active development here. “There is interest, we hold negotiations, but of course it is not a quick process, it requires time to make the final decision”, Albina Litvinenko, the agent of the Colombian brands in Russia and the CIS countries said. “But we have something to show, something new for the Russian market. Colombian brands have their edge”. Colombians have serious plans for Russia, and have good impressions of Russia. The trade show have resulted in 72 contacts made and 28 advance orders placed. The negotiations with the Moscow TSUM and GUM are being held. “Estel Adoni retail chain was very interested – they asked questions about possible exclusive rights — as well as big retail lingerie boutique chains. There are many requests from Ukraine, Belorussia and Moldova”, Litvinenko added. “Of the three brands represented at the trade show Laudela is an obvious leader. One should have been „blind“ not to place an order”. The products of the Colombian brands will appear in retail in March. For now the collections will be presented in multi-brand stores, not in branded retail stores. FashionUnited talked to the management of the Colombian brands to ask them about their impressions of the Russian market and their plans for future. Tell about the Colombian brands that participated in Mode Lingerie & Swim Moscow/CPM trade show (what is unique about them)? Printslab S.A.S. Diana Oviedo, CEO Printslab S.A.S. : Fabrics, underwear and swimsuits are between the best exporting Colombian products, and selected brands export to more than 70 countries; products are being recognized by high quality and rich designs. This year Colombia has received an important recognition as the best swimsuit producing country. Three Colombian companies had participated in the Mode Lingerie & Swim Moscow/CPM, and Prints Lab is one of them. This is a new company that bets on the good design, art and innovation. Juan Camilo Espinal, Managing Director, Ellipse Lingerie: Colombia has been recognized in Latin America for being pioneers in the lingerie and beachwear market. For more than 40 years Colombian lingerie brands have been exported throughout Latin America and the Caribbean. During the 80´s Colombia started being recognized in North American and Europe, nowadays you can find Colombian lingerie and beachwear brands in the whole world. We are known for great design and great quality. Colombia is one of the most important exhibitor countries for trade shows such as Mode City, Curve and MiamiSwimShow. Juan Felipe Ruiz Duque, Commercial Manager, Lau De La: Our daily challenge is to provide the final consumer with unique products that stand out thanks to innovation especially in hand-made components. The craft and artisanship are traditional for our country. This feature that has enabled us to stand up to the best swimwear brands in domestic and international markets. What are your impressions from the Mode Lingerie & Swim Moscow and the Russian market? Printslab S.A.S. Diana Oviedo, CEO Printslab S.A.S. : Our first question was… Why are we trying to export swimsuits to Russia? They live nine months under a real cold weather. How are we going to sale swimsuits there? Our questions were solved after our first day at Moscow, as we discovered people who wear really fashionable clothes, they like to be good dressed, dress with style and according to tendencies. The tradeshow was worth every moment of our trip. It was a little bit strange for us to be to a tradeshow crowded by selected business people. We were able learn about Russian market, analyse how people live, how they dress for work, at night, what they eat, how their lives flow into this megapolis. It was so important for us to meet the Russian life. At the end of the day, the Russian market showed more interest that we have been expecting for Colombian products. When we returned to our country, the final results were very good for all of our companies. Juan Camilo Espinal, Managing Director, Ellipse Lingerie: It was a pleasure for Ellipse to be at the CPM Moscow, we were impressed by the magnitude of the event which covered the main fashion categories: Premium, Accessories, Kids, Lingerie and Swimwear. Russia, as a part of the BRIC countries, has been one of the most important markets for fashion for more than ten years. After being in Moscow and St Petersburg it is clear for us how important fashion is in these countries. During the show it was a pleasure to meet beautiful, stylish, and classy women, style is everywhere here. The mood in the city was amazing: when walking through the GUM and TSUM galleries in Moscow and through the different floors of the DLT building in ST Petersburg, it was a pleasant surprise to know that Russians love fashion and style. 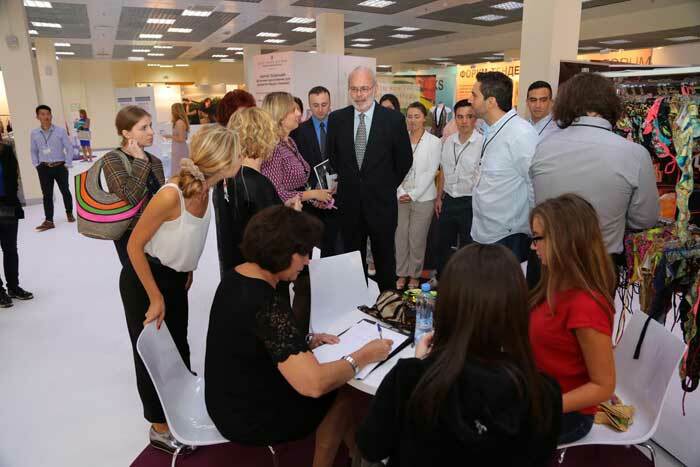 Juan Felipe Ruiz Duque, Commercial Manager, Lau De La: The fair showed us a Russia that is full of colorful fashion and exquisite taste for good stitching. Our company participates in 6 fairs around the world and this show us opened our minds to new product lines and global market needs in Russia. Why did Colombian brands decide to enter the Russian market. Are they doing that with the support on the national level? Printslab S.A.S. Diana Oviedo, CEO Printslab S.A.S. : At the beginning of the current year, a Russian lady went to Bogotá, Colombia, she met us and we started business relationship with her. Honestly, it was a little bit strange for us to think about Russia like a potential market to enter, but her knowledge let us trust her and place a bet to conquest a very far away land. During the process we realized that some Colombian companies had been already exporting to Russia, which facilitated us to start the export process for our products. Juan Camilo Espinal, Managing Director, Ellipse Lingerie: As I told you before we know that Russia is one of the most important countries for the fashion industry. We understood we can commence a long lasting commercial relationship in Russia and CIS Countries. We have the full support from the Colombian government entity, ProColombia (affiliate of the Ministry of International Trade), we started talking about Russia earlier this year with this entity and they decided to bring some agents to Colombia, and then in Bogota we were able to meet them. Juan Felipe Ruiz Duque, Commercial Manager, Lau De La: Like any other exporting company we have a project of worldwide expansion. Our brand is in the European market for five years already, and Russia is in our expansion strategy in Europe as a single country with its demand for new brands and product lines. What are the brands plans for development in Russia and what are their expectations here? Printslab S.A.S. Diana Oviedo, CEO Printslab S.A.S. : Russia is a huge challenge for a young company like ours, but we have procured to systematize all our process from the beginning, at this time companies can use technology to answer to the European market requirements. Our brand agent has the experience and knowledge that our company needs to grow our business there. Juan Camilo Espinal, Managing Director, Ellipse Lingerie: We want to start working with the Russian clients as soon as possible. After this first experience at the MODE trade show we know we have to improve the way we exhibit our new collections ensuring we provide all the relevant information and samples to potential clients, we need to show the clients our essence and our different product families. We know there is a great potential in Russia with home wear and we know that we can start doing business with this product line, and after gaining the clients trust in our brand we can continue developing the business with all the different lingerie products. We are prepared to conquer the Russian market. Juan Felipe Ruiz Duque, Commercial Manager, Lau De La: We have much work ahead to do in order to understand and to adapt to the needs of the Russian market. We see great potential in the growth of our brand in this market in the medium term. Where across the globe are your products represented now? What are their global positions? Printslab S.A.S. Diana Oviedo, CEO Printslab S.A.S. : Prints Lab is already represented in eight countries. We are known by our rich illustrated fabrics and products, as well as a new proposal for the wearable technology. Juan Camilo Espinal, Managing Director, Ellipse Lingerie: Ellipse has been in the lingerie business for more than 30 years, in 2014 it was bought by the Urrea Jimenez Holding, a family with more than 60 years in the lingerie business. Ana Urrea, our Creative Director, has been in the business for more than 20 years. We are now present in Colombia and Costa Rica with Ellipse stores. We also have our product in department stores and boutiques in more than 10 countries around the world, including: Mexico, Guatemala, Costa Rica, Peru, Chile, Bolivia, USA, Canada, Dominican Republic and the Caribbean. Juan Felipe Ruiz Duque, Commercial Manager, Lau De La: Laudela participates and has a presence in several continents and countries of the world. Every year we participate in the trade shows: Intermoda Mexico, Swimshow Miami, Colombiamoda, Lyon Mode City (Paris). Our brand has a presence in North America and Central America, South America, Europe, in the Middle East. We hope to reach more markets in the medium term. Tell about the Colombian fashion market in general: its peculiarities, scale, turnover? What do our countries have in common and what is different? What can Colombians use to attract the Russian audience? Printslab S.A.S. Diana Oviedo, CEO Printslab S.A.S. : The three companies who went to Russia are from Medellín, the Colombian fashion capital. Russia and Colombia are the two countries in good positions now have demonstrated throughout history the ability to overcome difficulties. We believe that this is possible thanks to a strong spirit of hard work and perseverance. Colombia may become attractive thanks to its taste for fashion-quality raw materials. Each product manufactured in this country is made with soul. Juan Camilo Espinal, Managing Director, Ellipse Lingerie: Our hometown, Medellin, has been named the fashion capital of Colombia as well as the most innovative city of the world. The fashion industry in Colombia is recognized for its high quality designs and hand made products. Colombians and Russians are very warm hearted, kind, and service oriented. Our countries have gone through similar tough times in the past and we both have been forced to overcome these situations and make the best out of it. To attract the Russian audience we can provide a high quality service and provide high quality handmade designs. Juan Felipe Ruiz Duque, Commercial Manager, Lau De La: The Colombian fashion has definitely reached very high levels worldwide, showing us as a world power in fashion, design and development of textile lines, competing with the biggest markets in textile production. We have always differed by high-quality clothes and designs showing our potential in artisanal production of each of our products. That enables us to be different from the rest of the world. Colombia and Russia have much in common in fashion sense. We have many beautiful women which allows us to see fashion differently to the rest of the world!